While I am always up for a decent harem anime, the genre tends to be extremely hit or miss. For every show that I found myself really enjoying, there always seems to be several that are painfully generic or go out of their way to annoy me as I watch. Maburaho unfortunately falls into the latter category, as the 24 episode series manages to waste its potential on boring plotlines and constant fan service. It’s also one of the few J.C. Staff produced anime that I have watched that I didn’t like, which is one of the reasons that Maburaho came off as such a disappointing watch. The series is set in a fantasy world where magic is commonplace and different schools are in place to help people learn and harness their abilities. A person’s ability is not only determined by the power of their magic, but how many times they are able to use it in their lifetime. The majority of the people at the prestigious Aoi Academy can use magic hundreds or thousands of time, but main character Kazuki Shikimori only has eight uses before he dies and turns to dust. However, early on after undergoing a physical exam (which is performed by a doctor wearing what looks like the power level indicator from Dragon Ball Z) it is revealed that Shikimori possesses the genes of a slew of famous magicians and has the potential to father the most powerful magician in the world. As you might expect, this sets up Maburaho as your standard harem where a completely average guy suddenly finds a bunch of girls vying for his attention. Every girl in the school initially decides they want Shikomori’s genes, but things quickly settle down and viewers become familiar with the three main female leads. Yuna is one of the few not after his genes, as she appears in Shikimori’s dorm room one day and proclaims that she is his wife, which is based off of a promise the two made when they were young children. The other two girls, Rin and Kuriko, are from powerful and wealthy families and both have different motivations (Rin rebels against her family and decides she would rather kill Shikimori rather than marry him while Kuriko tries to seduce him to get his genes at every turn). It doesn’t take long before they both begin to develop genuine feelings, which continues to push Maburaho into predictable harem territory. The series is divided into two distinct halves, and I’m going to spoil one minor plot element at the halfway point because it’s worth mentioning (and it has been over a decade since the show originally aired). Each of the first twelve episodes revolves around one of the three girls finding themselves in some kind of predicament, and Shikimori ultimately saves the day by using his magic. Although he only has eight uses overall, when he is able to use his magic the effect is very powerful and is able to vanquish powerful creatures and even fuse buildings together. Interspersed in between these various conflicts is plenty of fan service where the girls end up in compromising positions or in Kuriko’s case attempts to sleep with Shikimori (though he’s pretty good at running away from her) as well as a few humorous moments. The main issue I had with these early episodes was that for every interesting moment where the main cast has to fight a giant Behemoth monster or encounters the ghost of a princess who is centuries old, there are incredibly boring scenarios like helping one of the main characters learn to cook. Considering the fantasy setting and all of the elements Maburaho could utilize to make itself really stand out, it seems content to stick with the stereotypical school life anime elements and fan service a bit too frequently. With only eight magic uses and 24 episodes, at the halfway point Shikimori finally exhausts his magic and turns into a ghost. This was not only a plot element that I saw coming long before I reached episode 12, but it also represents the turning point where the series really started to lose my interest. Before becoming a ghost Shikimori may have been a fairly non-descript lead, but at least he was able to step up and save the day when the situation called for it. As a ghost, he’s unable to do anything and spends the majority of the episodes moping while the girls try and figure out if there is a way to restore his body. There are some moments that I did like, such as when the characters play a game of baseball against zombies and when it is revealed that Rin’s mentor is a werewolf and they have a duel. But just like during the first half, the second half is held back by episodes that scale back the fantasy elements and focus on generic school life/harem tropes along with more fan service than plot. I’m not opposed to fan service, but when it’s used to pad out an episode or as an excuse for a recap episode it leaves me uninterested in the series as a whole. The plot stumbles along for the 24 episodes, but what really kept me from enjoying Maburaho was the lack of characters that I truly connected with. I’m ok with anime that has a thin plot or not a lot of progression at all if the characters stand out and are quirky, but that wasn’t the case here. Shikimori’s a fairly inoffensive lead that has the same traits as the majority of the other harem leads from anime that came out before and during the 2003-2004 timeframe. He does start to develop a backbone and gains a bit more personality after a few episodes, but once the series decides to turns him into a ghost and he spends a good quarter of the series feeling sorry for himself that goes out the window. As far as the three leads go, Yuna’s character plays off the housewife trope and she often comes off as clingy and possessive while Kuriko is the self-centered rich girl that has far too much power. The writers do try and give her some humility towards the end, but it came just a bit too late and I never really found myself rooting for her. Rin is the only female lead that had some stronger moments, and her ability as a swordswoman did add some much needed action into many of the episodes. The supporting cast isn’t much better, as they throw in the “childhood friend” to compete for Shikimori’s attention. Even for a show that is now over a decade old, Maburaho’s cast feels like a retread of what has come before and doesn’t help it to really stand out from the crowd. Maburaho’s animation is competent but doesn’t have that many moments that will truly wow you. I’ve never seen anything from J.C. Staff that had downright bad animation, but even considering the year that this series originally came out (2003) there wasn’t a whole lot that made it stand out. The majority of the episodes take place in your standard Japanese high school and surrounding areas, with the only difference between this show and a slice of life being the ability of all the characters to use magic. 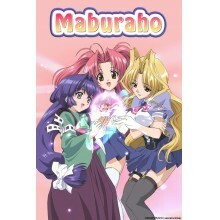 Whenever fantasy elements are used the special effects are decent and do grab your attention, but the overall look and feel of Maburaho maintains that early 2000’s harem/school anime vibe that has made quite a few series from that time period blur together. As far as the soundtrack, I wasn’t crazy about either the opening or ending themes as the songs were fairly generic J-pop with a singer that got on my nerves after a few times through. The voice actors and actresses do a good job considering the source material isn’t always that interesting, and if you’ve watched a lot of anime you’ll likely recognize a few voices from other series. Overall the production values are competent but there’s never anything animation or sound wise that will make this one truly stand out from other anime in the same genre, and I think that was true even when Maburaho was first airing. It’s certainly not the worst anime series I’ve ever seen, but Maburaho was a frustrating viewing. It had a decent fantasy settings and ideas to make use of, but it seemed like for every episode where something exciting happened the next one would go back to the standard school life romantic comedy format and put me to sleep. Combine that with characters that are either extremely stereotypical or just not that likeable and an emphasis on fan service over plot, and you have a series that just doesn’t cut it.